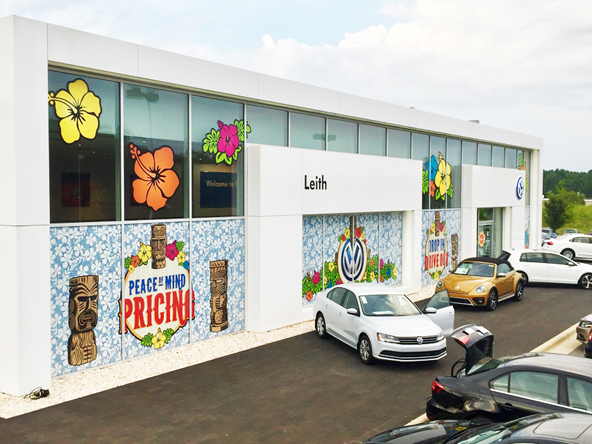 Colorful graphics were needed to help an auto dealer “turn a place that had the life sucked out of it into something fun.”That was the reaction General Manager Jerame Jones had when he took over the Leith Volkswagen dealership in Raleigh, North Carolina. He found the interior and exterior of the building to be very sterile with its plain white walls. Jones also noticed that employees were just going through the motions, resulting in stagnant sales. “[The place] had no energy, no culture, [and] no vibe,” he says. Jones had been very successful with rebranding at other Leith Automotive dealerships he had managed, and he quickly knew this location needed a fun, colorful visual rebranding. For this Volkswagen makeover, Jones turned to local SpeedPro Imaging of Apex, NC Owner Mark Simmons for ideas. His studio began a working relationship on multiple projects with Leith Automotive about a month after Simmons opened his doors eighteen months ago. 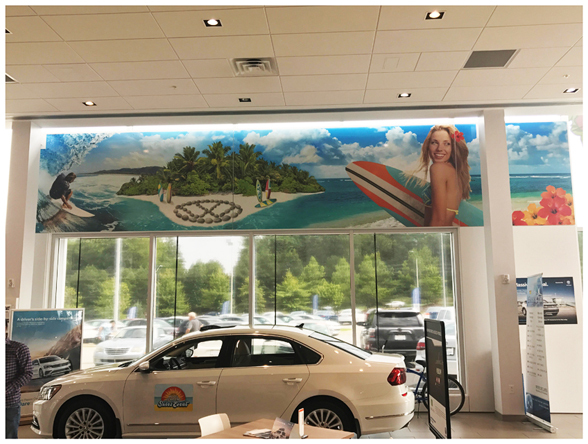 Harkening back to the beach culture image Volkswagen had cultivated in advertising during the 1960s and 1970s, Jones wanted to recapture that magic and use a Polynesian island vibe to enhance the dealership both outside and inside. Larger-than-life, floor-to-ceiling colorful hibiscus flowers, Tikis, and surf boards, wrap the building’s exterior windows creating a fun, unique atmosphere that fits right in with the VW brand and attracts drivers’ attention. Meanwhile a large beach scene wall mural continues the theme inside and brightens the mood of both employees and customers. 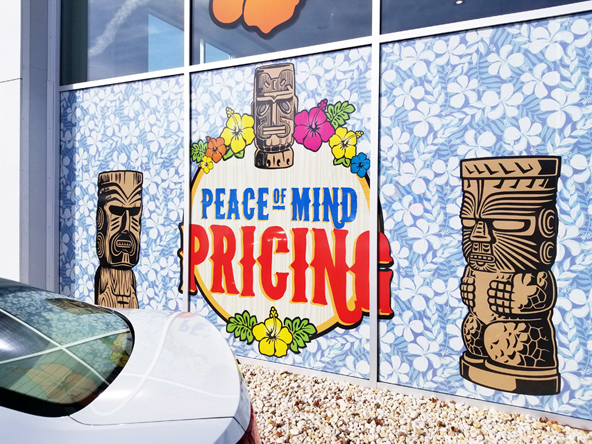 Tiki statue window graphics also help reduce sun glare inside. 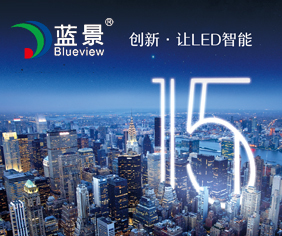 This project is an example of one of the hottest trends today in commercial interiors— Experiential Graphic Design (EGD), which connects people to a place or brand by creating memorable experiences through graphic design applications; in turn, it improves the consumer experience and boosts employee morale. 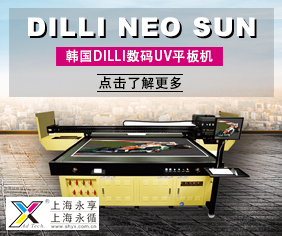 Businesses are now turning to printing companies to help visually enhance their environment with EGD solutions. Simmons had worked as a long-term retail executive yet yearned to get involved in the sign industry. He feels his background provided a perfect fit for operating his SpeedPro Imaging studio and satisfying the needs of his clients. “I had experience in both operations and sales and have always had an eye for detail,” he says. Simmons says that his shop is able to take clients’ ideas and, in a relatively short period of time, convert them into a great solution. He is able to do so with three employees in defined roles for production, design, and inside sales. “However, being a smaller operation, everyone wears a lot of hats and jumps in and helps out whenever they can,” he says, noting that he manages outside sales relationships and keeps an eye on overall operations. 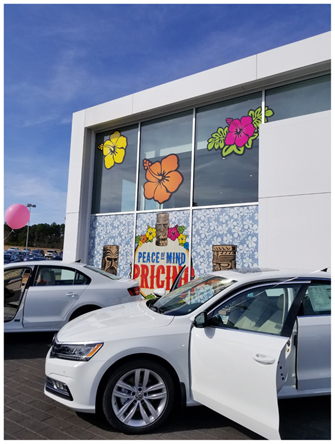 The project for this particular Leith Volkswagen dealership in Raleigh was the most extensive inside-outside job that his shop had ever done. Simmons sat down with Jones and explained to him how his studio’s printing technology could bring the building to life. A majority of the front of the building is glass windows. The upper portion of the glass panels feature strategically placed large format cut-vinyl hibiscus flowers, while the lower portion hosts a full see-through perforated wrap adorned with Tikis and Hawaiian flowers. Hibiscus flower graphics adorn the top half of the front facade. The 30-by-6-foot interior wall mural features a beach scene put together with surfers and other island-inspired images. Since these interior images were photographic (whereas the outside was vector), design time was pretty extensive. “We had to blend together different photographic images to create this mural and make sure they were large enough and crystal-clear enough so they wouldn’t pixelate when we printed them out. Photoshop® helped us here,” says Simmons. SpeedPro Imaging of Apex, NC used their HP Latex 560 to print out all the vertically oriented panels and cut graphics. Using a boom lift, the installation took two days. Since the install took place during a very hot time of the summer, Simmons and his crew avoided blazing hot glass and installed the outside graphics in the evening, after the sun had peaked. For the interior, they cordoned off the wall mural installation area and worked during daytime hours on the boom lift. The vinyl Polynesian theme even extended to loaner car. 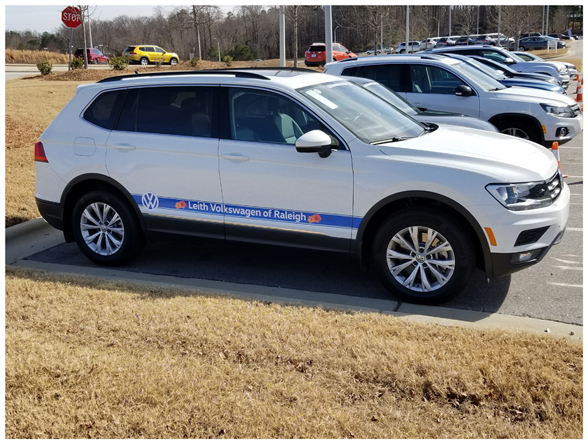 Enthusiastic reaction to this rebrand has carried over into additional Polynesian-themed work provided by SpeedPro Imaging of Apex, NC to Leith Volkswagen—partial vinyl wraps featuring similar iconography for loaner cars, printed sweatshirts, and custom nametags. From printable wallpaper-type materials to window graphics to building wraps, the opportunities are endless in the field of EGD.